GoDurham has been recognized as the urban Transit System of the Year by the North Carolina Public Transit Association for demonstrating exceptional achievement and leadership in its community. Research Triangle Park, NC (May 10, 2018) – GoDurham has been recognized as the urban Transit System of the Year by the North Carolina Public Transit Association for demonstrating exceptional achievement and leadership in its community. The award also signifies how successful the agency has been at promoting mobility, removing barriers that cause isolation and promoting economic growth while providing safe, efficient and reliable transit service. To make its service even safer and friendlier, GoDurham also began offering free Wi-Fi on all buses and installed high-definition video surveillance on more than 30 buses, Middleton says. On average, GoDurham transported 35 passengers an hour in 2017, compared with a peer average of 21 riders an hour, outpacing transit systems in Charlotte, Richmond and Norfolk. 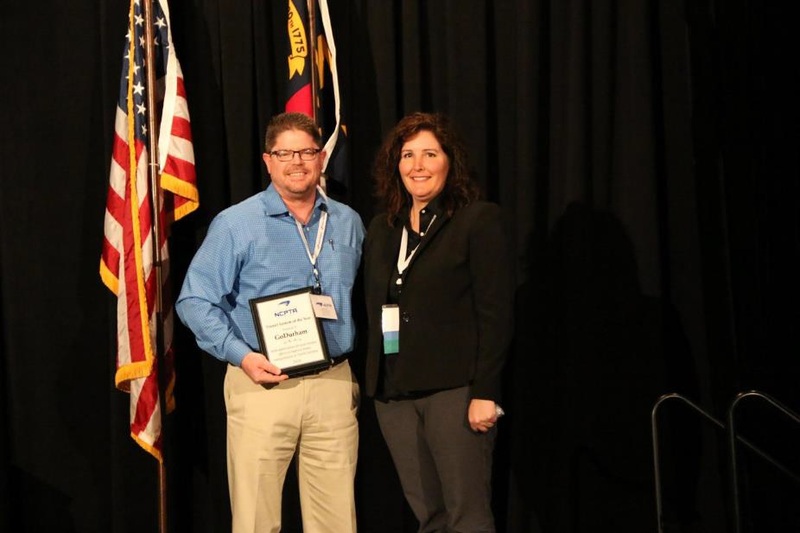 The award was announced in April during the 2018 NCPTA annual conference in Wilmington. The North Carolina Public Transportation Association is a private nonprofit organization that represents public transportation providers in all 100 North Carolina counties.